August was a really strange reading month for me. It started off so well with a pretty successful week of constant reading and then it sort of plummeted due to the emergence of a pretty severe book hangover. Thanks, BOOKS! Towards the start of the month, I took part in the 7 in 7 readathon. The idea was to try and read 7 books in 7 days or at least 7 things in 7 days. I didn't quite manage that, by any means, but I started off pretty well and I managed to polish off three books within the time period. Not too bad, eh?! However, the third book I read gave me a massive reading hangover and I slumped for a while. Side note: check out my recent post on how to get out of a reading slump if you haven't already *wink* Thankfully, after a two week break, I was able to pick up another book and finish it before the month was out. Huzzah! How was your reading this month? Let me know what you've read this month in the comments below! One day a fakir leaves his small village in India and lands in Paris. A professional con artist, the fakir is on a pilgrimage to IKEA, where he intends to obtain an object he covets above all others: a brand-new bed of nails. Without adequate euros in the pockets of his silk trousers, the fakir is...confident that his counterfeit 100 euro note and his usual bag of tricks will suffice. 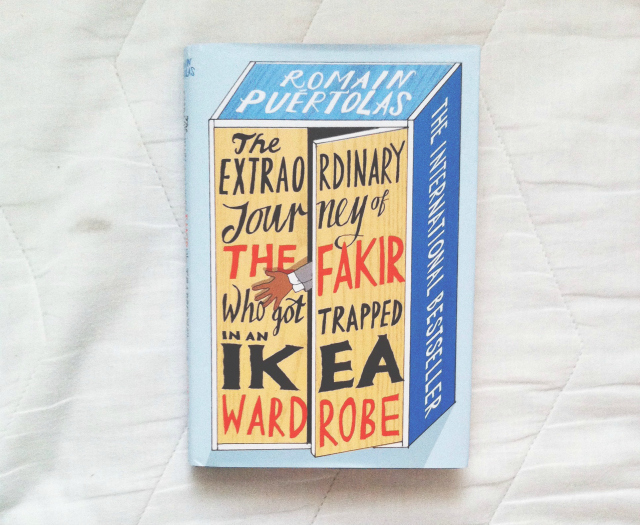 But when a swindled cab driver seeks his murderous revenge, the fakir accidentally embarks on a European tour, fatefully beginning in the wardrobe of the iconic Swedish retailer. Fast paced farcical adventure that played out like a classic sitcom or an old Steve Martin movie. This book has taken the world by storm following its French release last year. Back with an English translation, The Extraordinary Journey is set to be a pretty high profile read this summer, the cover art and engaging title pretty much ensure it! However, for me, it was just okay. The situations are ridiculous and far fetched but it's fun and endearing if you're in the right mood for it. Whilst I liked the pacing the majority of the time, I did think the ending was a little abrupt and I felt like a few things were just swept under the rug a bit too quickly. Furthermore, the characterisation was a bit stereotypical and I did feel a bit uncomfortable because of it but that's just me. The roles just felt like ones that I had seen portrayed in media time and time again and I felt a little let down by that. Overall, it was an easy poolside-friendly read that I sailed through in one sitting that I can see lots of readers picking up this summer. I'm not head over heels for it but it was a nice little tale, regardless. I'd recommend this book to readers that are looking for a quick and easy read full of adventure or to those that are currently experiencing a bit of a reading slump. *This book was sent to me for consideration but, as ever, all opinions are my own. You can't buy me with books, contrary to popular belief! In this striking novel-in-stories, a series of strange apocalypses have hit America. Entire neighbourhoods drown in mud, glass rains from the sky, birds speak gibberish, and parents of young children disappear. Millions starve while others grow coats of mould. But a few are able to survive and find a light in the aftermath...Rendered in a variety of narrative forms, Blake Butler's full-length fiction debut pants a gorgeously grotesque version of America. Pretty horrifying collection of post-apocalyptic vignettes. I bought this after spying it in the 'related reading' section whilst buying Light Boxes by Shane Jones. I wasn't entirely sure what to expect but I knew it covered ideas that I was interested in and, if I'm honest, I liked the cover. It was dark and interesting and kitted out like an old library book found on someone's floor. 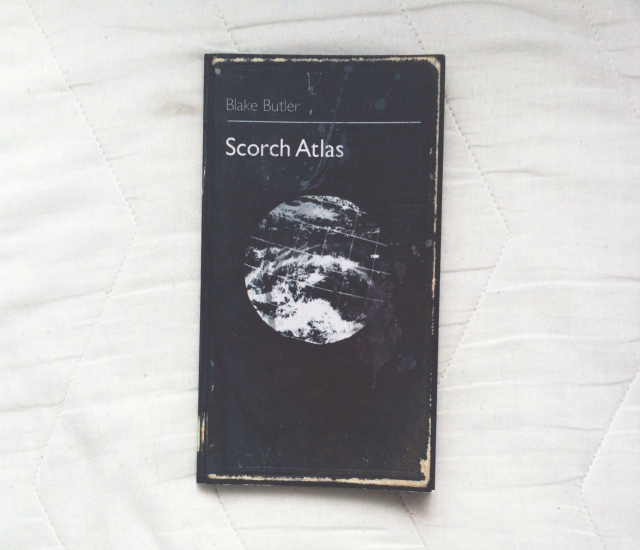 Scorch Atlas was terrifying and, on more than one occasion, completely fucked up. The tales followed broken people, more often than not part of broken families, that were trying to exist in a world that was beyond both their control and general understanding. I think I found Scorch Atlas so terrifying because all of the horrors occurred in suburbia, with Butler preying upon suburban fears of familial loss and destruction to get his points across. It was dark and carnal, melancholic and visceral. It explored decay in every sense and Butler's characters were all devoid of hope, of meaning and of reason as a result. I really admire the way in which Butler executed his ideas, straying from traditional forms to play into the hands of the everyday. One of the tales, for instance, was merely a log of old waterlogged photographs. I think I would've given it a 4, rather than a 3, if it was a little less dark and if the narrative voice was changed up a little throughout. However, I did greatly admire the tone of this collection. It didn't falter and, consequently, I could have wept on many occasions! This is something that I would suggest you dip in and out of, rather than read in one go because it is very dark. I would recommend this to those of you that are interested in suburban post-apocalyptic landscapes but, due to the graphic content, I'd only suggest you read it if you've got a strong stomach! I absolutely bloody loved this book! I put off reading Du Maurier for so long, despite having three of her books on my shelves and a curious desire to read her work. After months of putting them off for no apparent reason, I decided to delve in and read Jamaica Inn. I'm clearly an absolute idiot for waiting for so long because I thought it was fantastic! I think I was about 12 pages in when I wrote a little Goodreads update to let everyone know that I was 'all over it like a wet flannel' - it was just that much of an instant attraction for me. This book contained some absolutely extraordinary, and undoubtedly harrowing, scenes that will stick with me for a long time. Du Maurier takes gothic clichés and reinvigorates them, making them something to be excited about rather than something to cross off your i-Spy list. Some readers probably wouldn't rate this book 5 stars but I just love me a dark gothic mystery so, for me, the rating is richly deserved. Romantic in its sublimity, Jamaica Inn is actually full of unromantic ideas and I absolutely adored that duality. This book is full of men who are seriously flawed. As I put it in my review notebook, they're either 'complete dickheads' or 'seriously basic'. However, Du Maurier treats us to a strong female protagonist akin to Charlotte Brontë's Jane Eyre. Mary herself isn't perfect, and she makes bad decisions just like the rest of us, but she is strong willed, determined and wise. The fluidity of the prose, overwhelming sense of foreboding and the twisting plot meant that I could have easily read this in one sitting had time allowed for such a luxury. Regardless of whether or not you anticipate the ending (I personally didn't) you will seriously enjoy getting there. It was a really enjoyable reading experience. Although, it did give me a seriously long hangover. Boo! I would recommend Jamaica Inn to anyone that wants to read it, especially those who love really dark brooding classics. Make sure you're reading it in a cold, dark and rainy setting for optimal joy. 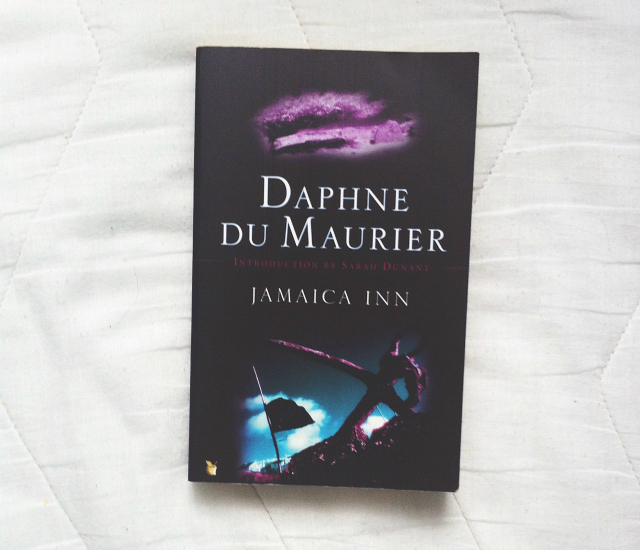 I cannot wait to read more Du Maurier! I bought this book from Mr B's Emporium in Bath after a lengthy conversation with a staff member about Ness' books and the copious amounts of tears that we have shed over them. It took me quite a while to get round to it but I needed something fast paced to pull me out of my slump and I thought that Ness would be the best option. Thankfully, he was! Ness has his own brand of sci-fi-dystopian-realism that I just find so digestable, meaning I usually read his books within one sitting. I read this book on Bank Holiday Monday and it was the perfect remedy to the stormy weather outside. Ness situates his characters in the most extraordinary settings and has them process some really traumatic experiences but he always always always makes them tangible and real. The characters in this book were no exception and it was really moving to not only watch them flourish individually but also to watch their friendship blossom over the pages. I also love that his characters embrace who they are but they aren't defined by their supposed diversity. They're dimensional. The story was driven by aching determined loss and that grief took the story in directions that I wasn't expecting and I really liked that about it. The changing directions and constant questions made it an action-packed fast paced read - a quality that the majority of Ness' books all share. I think one of the things I love the most about Patrick though is that, first and foremost, he really cares for his characters and his readers, and that shines through in everything he writes. He's a good egg. I always tend to pick up his books when I need them the most or when I am the most susceptible to their message, which is probably why they reduce me to tears every frickin time. I actually tweeted Patrick to tell him to sell his books with branded tissues attached and he favourited the tweet, so lets hope he is taking note! More Than This was a really cathartic read for me due to its overarching message: There is more to your story and so much more just around the corner. You just have to reach out, grab onto whatever or whomever you can and go for it. Or at least that's what I got from it! More Than This reminded me that no matter what life throws at me, and it likes to throw some pretty huge curve balls from time to time, I always 'go in swinging' and that alone is something that I should be incredibly proud of. Patrick just gets me and any book that restores your faith in yourself or life in general is, in my opinion, a pretty good read. The vast majority of my book collection has been bought with my own money. Sorry, bank balance! However, sometimes I'm sent books to review. These books are marked with *. Handy, eh?! This page also contains affiliate links. If you buy the books through the links I've so lovingly provided, I'll earn a tiny commission to put towards books in the future. If you've used my links, thank you. You're a good egg. I will now have to read Jamaica Inn! The Extraordinary Journey seems to be the kind of novel you pick up when you're feeling a bit low and you want something to cheer you up. I've read other reviews and they all agreed: it's a nice light summer read, but it could have gone a little bit deeper. Your love for Daphne Du Maurier et for Patrick Ness shows ;). I've been meaning to read A Monster Calls for a while now, since everyone raved about it. As for Daphne Du Maurier, I know that I should probably read Rebecca but I haven't gone round to buy it yet. It's funny because you loved Jamaica Inn when a lot of people said it wasn't their favourite at all. Interesting to see all the different points of view :). This month, I've read 2 or 3 books I think you might like. - The Penelopiad by Margaret Atwood is a quick and interesting read giving us the point of view of Penelope regarding the absence of Odysseus. It was very well-done and the character is highly relatable despite the few years that separate her from us haha. - Silk by Alessandro Barrico is also pretty short. It's very poetic, melancholic, it's just a beautiful story. I read the French edition, the one with all the gorgeous drawings, and it definitely added something. - If you want a bit of fantasy, but something quite short as well, then don't hesitate to pick up The Emperor's Soul by Brandon Sanderson. It's only 175 pages long but I was immediately drawn to the universe. Sorry for the long comment! I wish you a good reading month. I was in a reading slump too, but I feel like I'm in the mood to read now. We need to take it easy ;). I do love your book reviews Bee, you describe them all so well and always make me add more and more to my list! 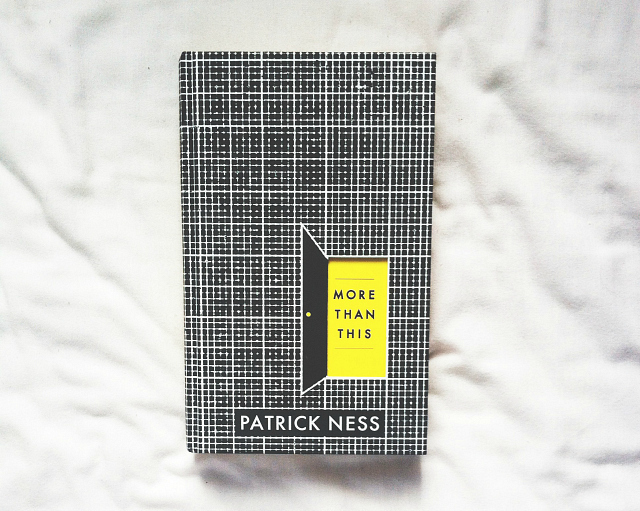 Oh God, I've been wanting to read something by Patrick Ness for a while but now with your review is a need!! I haven't read much this summer, due to studies, but I've plenty of books to read that I'm looking forward to. This has made me want to read More Than This, it's about time I gave Patrick Ness a go! I always, always look forwards to your book review posts! They never fail to get me adding to my book wishlist. Jamaica Inn and More Than This have gone straight on there!